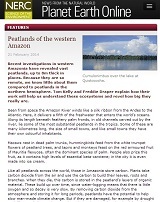 The article, Peatlands in the Western Amazon by Tom Kelly and Freddie Draper has just appeared in NERC’s in-house scientific showcase magazine. It puts Tom and Freddie’s work on Amazonian peatlands into context. You can view it online here.